The Giant Houndstooth Dip Dye Wunder Under Pants. Shown with the Wild Tank. Soul Geo print Runbeam SS and Runday crops. Be Present Jacket and Textured Stripe High Times Pant. New Textured Stripe Flow Y Bra. Modern Racerback tank and Better Together Pants. I braved the mall today to return a few things - High Times Pant (don't know what I'd use them for), Light Gray Pique Think Fast PO (already have the hoodie in this color), and Embrace Hoodie Luscious (too small) - and to pick up a Christmas present for my niece. I got her a very pretty Deep Fuchsia/Deep Zinfandel Herringbone Village Chill scarf at Ivivva. The adult line could certainly use some colorful herringbones and piques. I'm about done, along with everyone else, collecting gray and black pique and herringbone pullovers and jackets. May I just say how much in love I am with brown herringbone fabric!!! It is getting softer and softer as I am wearing it and believe it or not I can tell the difference that my new giant herringbone fabric on define jacket is inferior to brown! Love it as well, but even with more washes, it is still not as soft and slightly thinner. I scored a menthol scuba this weekend! Anyone know if the US is getting those houndstooth WUPs? Also, can anyone who has them comment on the thickness and/or rise? I would love to know if they are thick and compressive with a higher rise like the brown giant herringbone WUPs, which are so freaking awesome btw. I returned my textured high times pants today also. I was torn because I know they will likely sell out, but I'm tired of hanging onto items because OTHER people love them. That is really illogical unless you are one of those ebay resellers (I am not...too busy to bother). I did try on my size down while I was at the store, and while they did fit much better, they still weren't very bum flattering on me. Sorry but that is my biggest criteria for keeping Lulu pants. Pathetic yes, I know! Are the edges of that Ivivva scarf finished or raw? I saw this on their website and thought it was really cute, a vinyasa in that print would be amazing. where did the colors go? They made at least one in colour, the heathered herringbone heathered black grape nightfall. If I recall correctly, I was not won over by the texture of this one in store. I thought when it came out I would buy it right away. I have a neutral vinyasa in mini check pique white heathered black which is so soft, and the bordeaux bumbleberry stripe from this year which is so thick and soft. I think I can pace myself on buying anymore. That herringbone ivviva is great! I so wish we had that color way and the Zinfandel in vinyasas. @ anon 9:58 pm - they're raw, unfortunately. 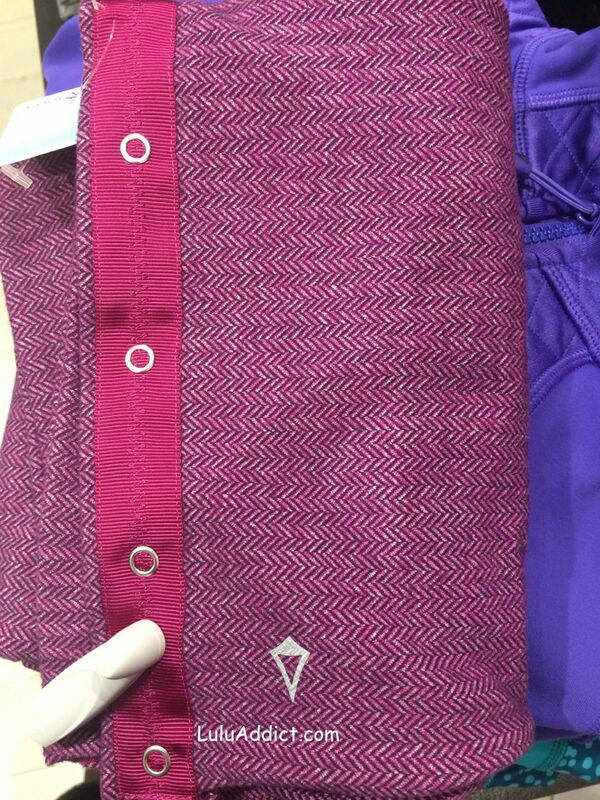 @ anon 3:33a m- I know they had a couple of colored vinyasas in the black grape herringbone and nightfall mini check pique but it would be nice to have a pullover in a nice deep purple. 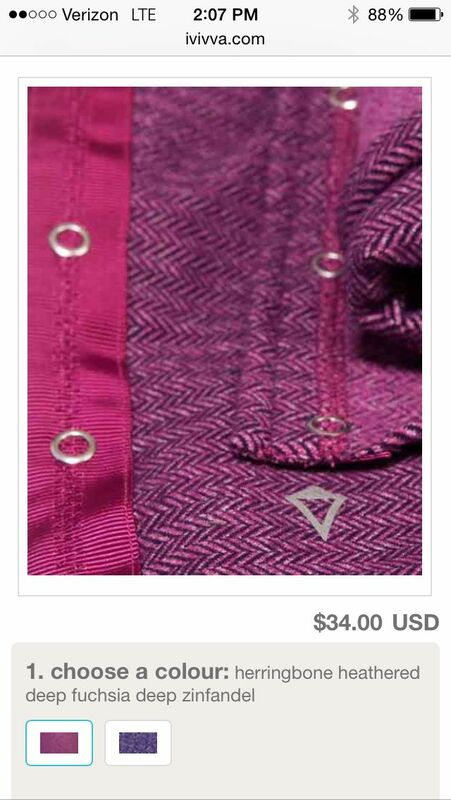 The pique Turn Around LS tops came out in colors a few years ago - paris pink, plum, and persian purple. All I wanted for Christmas is a Define Pique in cranberry or black grape or in any purple/red colour. Grey is so boring. Love that pretty white, striped Modern Racer Tank! Anybody know if it's available in the US? I love the houndstooth pattern, but I can't stand tight-ankle pants so WU are not for me. I'm hoping they skinny will or groove them, but I'm guessing that won't happen. Never know! I got the purple and black herringbone Ivviva scarves for one of my 8-year olds. She doesn't like dressing like me as much as I'd like her to, however... Sigh. @ anon 8:20 am - Yes, I saw it in my store yesterday. Has anyone in Canada seen gratitude wraps? I'm looking for one or two for myself :) or maybe you're selling one!? Looking for a size 4-6 in black or navy. Can someone also comment if they fit tts? LLA did you see the houndstooth in store? or any of the water bound items? they should be hitting socal shortly right? @Alejandra - I didn't see either the houndstooth pant or the water bound stuff in the store yesterday or this morning. Alejandra I saw the houndstooth WUP in my store today! I tried them but didn't like them enoug to get them. Also I had to size up because they didn't have them in size 2. I'm getting tired of loving something only to see they didn't do it in my size! Ebonycrause - GW are in metrotown and oakridge in Vancouver. I saw them in inkwell, a light grey and a darker grey (listed as heathered black IIRC). I tend to size down in GW so it's not as billowy in the body. Arms are fitted on me but I can still fit a thin LS underneath. Hey again - do you live by either of those stores ? Or are going back anytime soon? Would you be able to angel one or two for me - my store hasn't got them and I don't want to miss my chance !